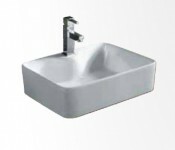 Rectangular washbasin 48×37 cm without overflow. Faucet hole diam. 35 mm.